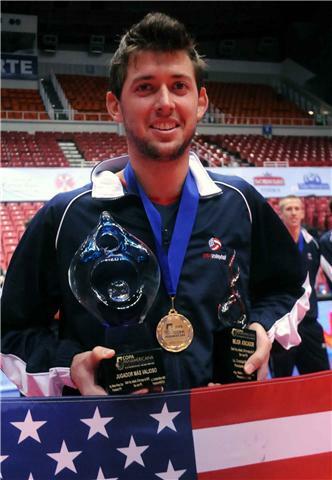 SAN JUAN, Puerto Rico, May 29, 2010 � USA Jayson Jablonski was selected as the Most Valuable Player of the Men�s Pan American Cup won by his side on Sunday with a victory over Argentina at Roberto Clemente Coliseum in San Juan. Jablonsky also took home the honors as the best attacker of the competition. 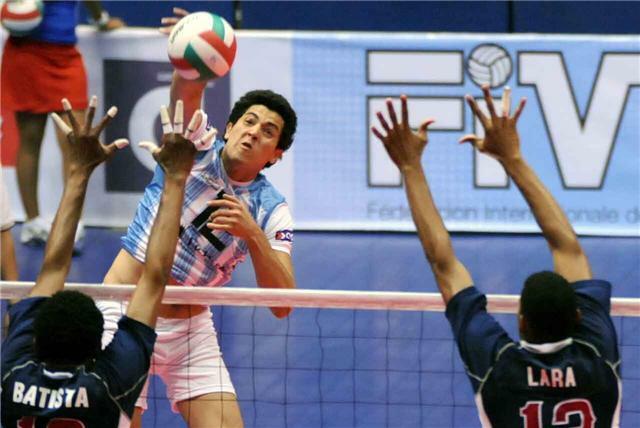 Brazilian Gustavo Bonatto resulted in the best blocker, while Argentinean Mariano Giustiniano won the trophy as best server and Puerto Rican Victor Rivera topped all the scorers of the tournament. SAN JUAN, Puerto Rico, May 29, 2010 � USA continued its winning streak in the Men�s Pan American Volleyball Cup by claiming a third consecutive title and fourth overall following a 3-0 (25-23, 25-21, 30-28) victory over Argentina in the decisive match on Saturday at Roberto Clemente Coliseum of San Juan. 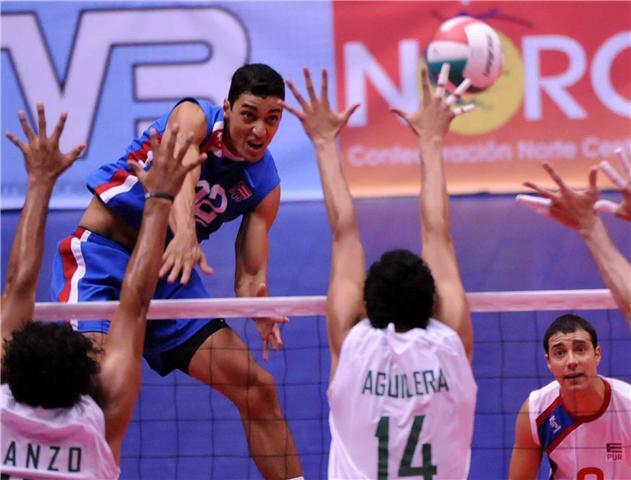 SAN JUAN, Puerto Rico, May 29, 2010 � Hosts Puerto Rico won the bronze medal of the Men�s Pan American Volleyball Cup after scoring a 3-1 (25-18, 25-17, 16-25, 25-17) victory over Brazil at Roberto Clemente Coliseum on Saturday. 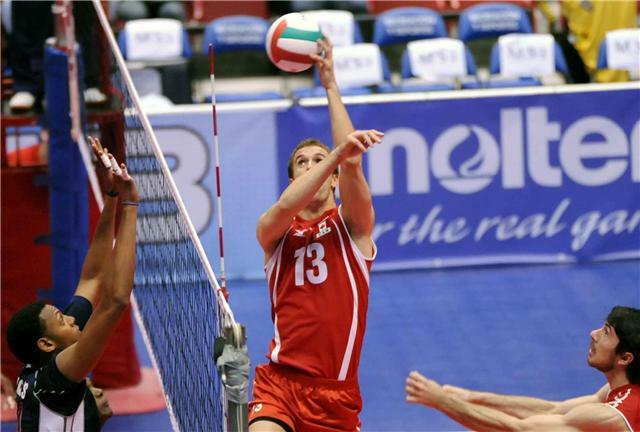 SAN JUAN, Puerto Rico, May 29, 2010 � Canada scored a straight sets victory over Dominican Republic 25-15, 28-26, 25-10 in the match for the fifth position of the Men�s Pan American Volleyball Cup on Saturday. SAN JUAN, Puerto Rico, May 28, 2010 � Argentina scored an amazing comeback from two sets down and defeated host Puerto Rico 27-29, 23-25, 25-20, 25-22, 15-10 advancing to a title match against defending champions USA in the Men�s Pan American Volleyball Cup on Saturday. 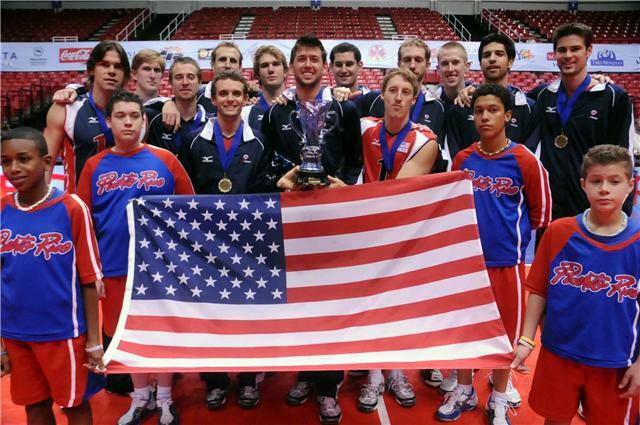 SAN JUAN, Puerto Rico, May 28, 2010 � USA advanced to the gold medal match of the Men�s Pan American Volleyball Cup following a hard-fought 3-0 (26-24, 26-24, 25-18) victory against Brazil on Friday night. The Americans will be trying for their fourth overall title and third in a row. 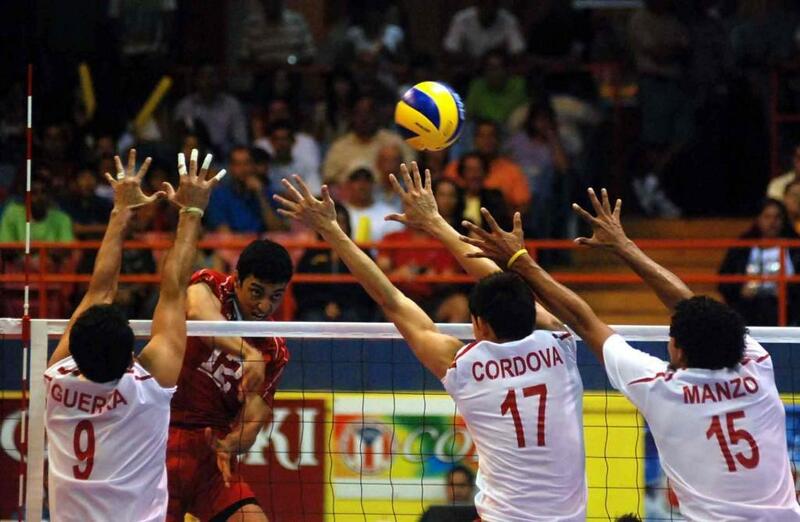 SAN JUAN, Puerto Rico, May 28, 2010 � Mexico scored a 3-1 (25-19, 23-25, 25-15, 25-20) victory over Colombia on Friday and finished in seventh place of the Men�s Volleyball Pan American Cup. SAN JUAN, Puerto Rico, May 27, 2010 � Puerto Rico overcame Canada in a five-setter thriller (25-23, 17-25, 25-22, 28-30, 16-14) and booked a ticket in the FIVB Qualification Tournament for the 2011 World League. The victory sent the home team to the semifinals of the Men�s Pan American Cup alongside Argentina, Brazil and USA, teams already qualified to this year�s world event. 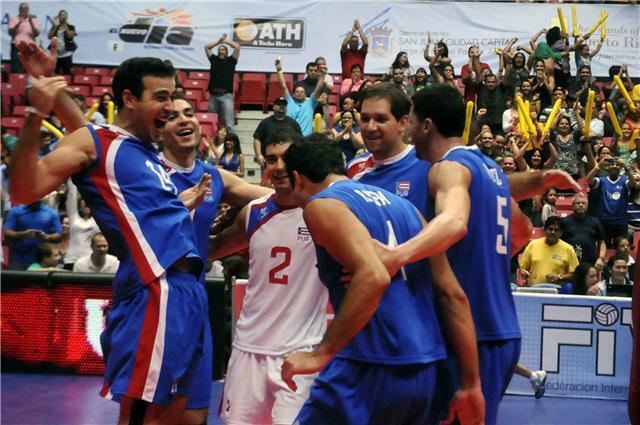 SAN JUAN, Puerto Rico, May 27, 2010 � USA dispatched Dominican Republic in straight sets (25-14, 25-18, 25-18) and will face Brazil in one of Friday�s semifinal matches of the Men�s Volleyball Pan American Cup. The winners had the advantage in blocking (9-4) and also in the serves category (7-3). 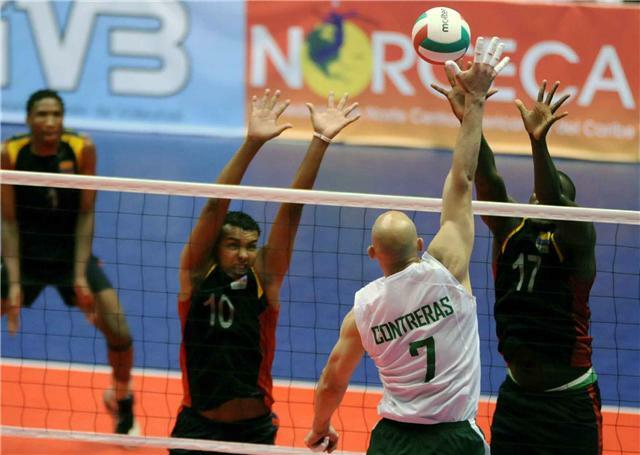 SAN JUAN, Puerto Rico, May 27, 2010 � Colombia claimed a comeback victory over Venezuela in five sets (25-22, 19-25, 21-25, 25-21, 17-15) advancing to a match against Mexico for the seventh place of the Men�s Pan American Cup on Friday. SAN JUAN, Puerto Rico, May 26, 2010 � USA recovered from losing the first set and defeated Puerto Rico 3-1 (19-25, 25-19, 25-18, 25-23) to win Pool B of the Men�s Pan American Cup but both teams ended in the quarterfinals round of the event. Idle Brazil joined Argentina in the semifinals with a better points-ratio (1.105) than USA (1.085). In Thursday�s quarterfinals Puerto Rico will meet Canada and USA will play against Dominican Republic. 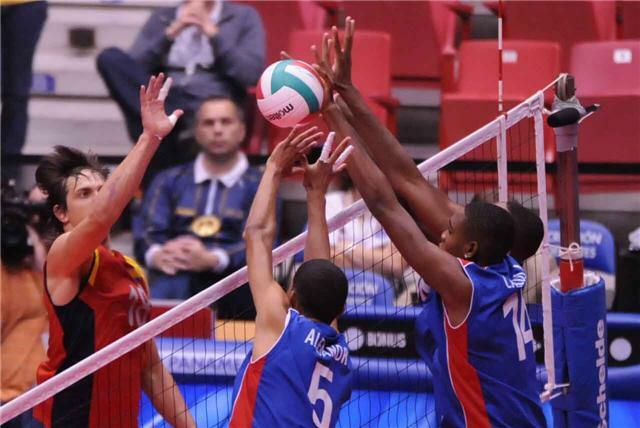 SAN JUAN, Puerto Rico, May 26, 2010 � Dominican Republic advanced to the quarterfinals of the Men�s Pan American Cup after recording a 3-0 (25-18, 25-17, 25-19) victory over Venezuela on Wednesday. The Dominicans outscored the defeated side in blocking (8-5) and ace services (5-1). Venezuela will meet Colombia in the eliminatory for the 7-9 positions on Thursday. 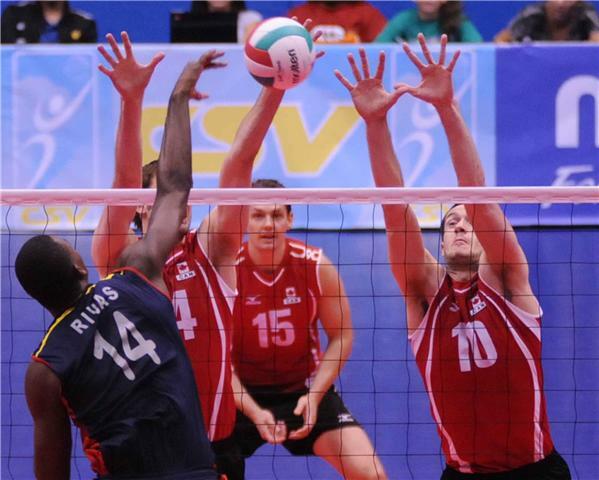 SAN JUAN, Puerto Rico, May 26, 2010 � Canada booked a spot in the quarterfinals of the Men�s Pan American Cup following its 3-0 (28-26, 25-16, 25-14) victory over Colombia on Wednesday at Roberto Clemente Coliseum in San Juan. The young Colombian team battled equally with the more experienced Canadians during the first set but the North Americans dominated the rest of the way. 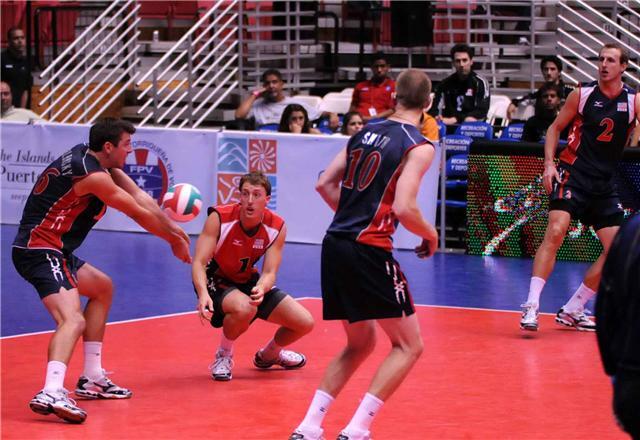 SAN JUAN, Puerto Rico, May 25, 2010 � USA edged Mexico in a Pool B sensational five-setter to cap the second day of action in the Fifth Men�s Pan American Cup. The score was 19-25, 25-23, 25-18, 26-28, 15-9. The Americans and Puerto Ricans will decide the group winner on Wednesday. 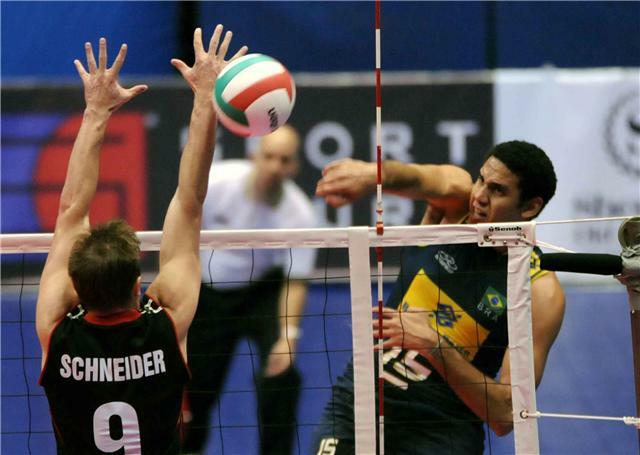 SAN JUAN, Puerto Rico, May 25, 2010 � A defiant young Brazil side made a sensational comeback after losing the first two sets to defeat Canada 3-2 (16-25, 20-25, 25-20, 25-23, 15-8) and claim the top place of Pool A in the Men�s Pan American Cup on Tuesday. The Brazilian victory by slight margin enables Argentina to secure a direct place in the semi final round due to a better points-ratio. SAN JUAN, Puerto Rico, May 25, 2010 � Argentina scored a 3-0 (25-13, 25-19, 25-22) victory over Venezuela on Tuesday and secured first place of Pool C in the Men�s Pan American Cup with a 2-0 record. The Argentineans, who out matched their rivals in blocking 11-1, had Federico Pereyra and Mariano Guistiniano as best offensive weapons with 13 and 12 points respectively. 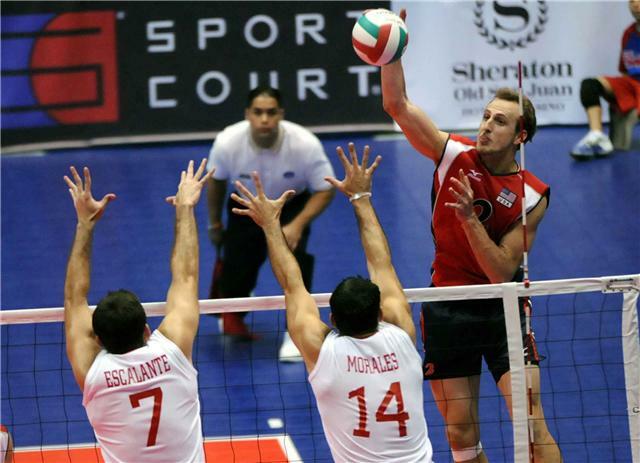 SAN JUAN, Puerto Rico, May 24, 2010 � Puerto Rico defeated Mexico in four sets (25-20, 21-25, 25-23, 25-18) in Pool B of the Men�s Pan American Cup on Monday night at Roberto Clemente Coliseum. Hector Soto led four Puerto Ricans in double figures with 31 points to lead the winning attack. Enrique Escalante contributed 13 points and Jose Rivera and Victor Rivera chipped in 10 apiece. 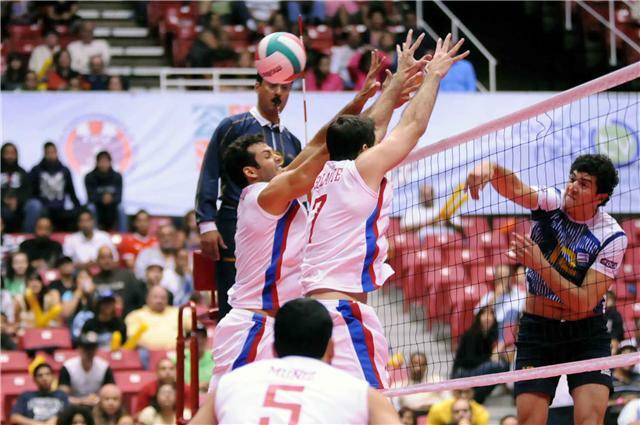 SAN JUAN, Puerto Rico, May 24, 2010 � Argentina swept Dominican Republic 3-0 (25-19, 26-24, 25-22) in the second match of opening day in the Men�s Pan American Cup. SAN JUAN, Puerto Rico, May 24, 2010 � Brazil scored a 3-1 (25-17, 25-14, 24-26, 25-23) victory over Colombia in the first match of the Men�s Pan American Cup at Roberto Clemente Coliseum in San Juan, the capital of Puerto Rico. 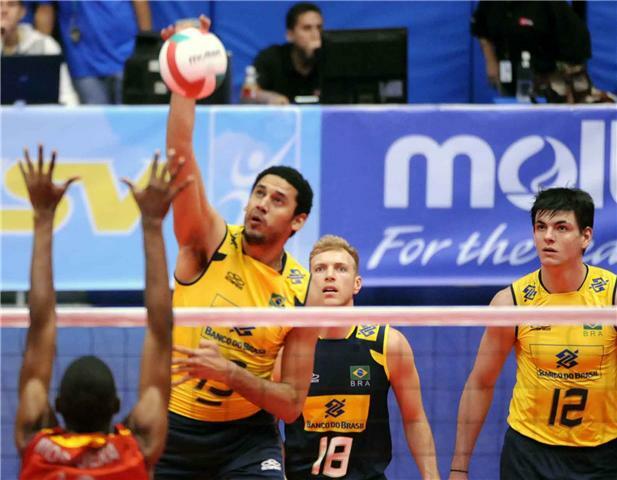 The taller Brazilians, who have a 2.05 meters height average, topped their opponents in blocking 12-7 and also dominated the service category 6-1. SAN JUAN, Puerto Rico, May 24, 2010 - USA Coach Richard McLaughlin is confident of success in the 2010 Men�s Pan American Cup when the competition allows for the first time entries from both the NORCECA and the South American Confederations. Even tough the challenge looks to be stronger, the Americans say they are in better shape and well prepared. 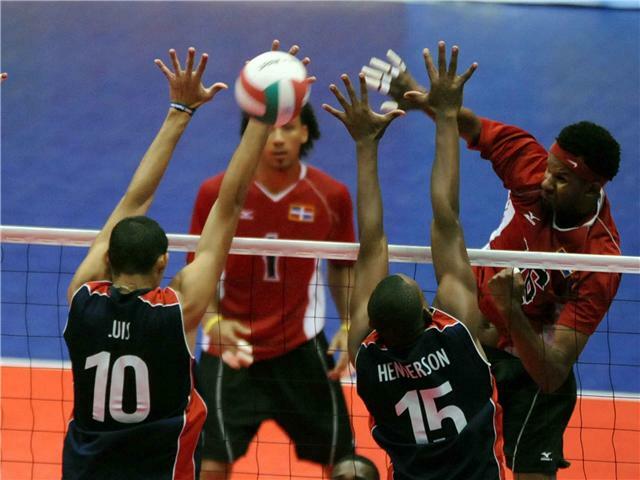 SAN JUAN, Puerto Rico, May 23, 2010 � The Fifth Men�s Pan American Cup starts on Monday with the participation of nine teams from NORCECA and South America Confederations.